Thompson’s Mills on Thursday, a sunny but cold February day. The silos are undergoing repairs. There’s no bad day to visit Thompson’s Mills, the state park east of Shedd. And if you’re new to the mid-valley, you owe yourself a trip there. 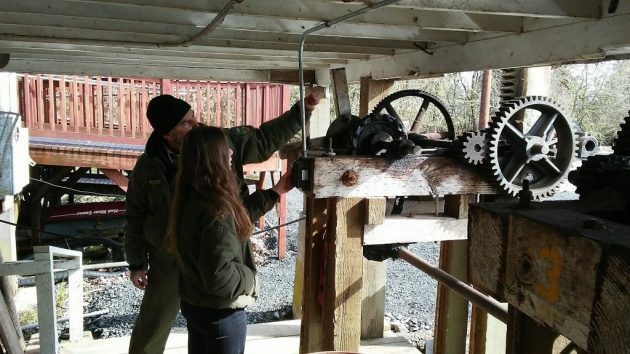 As the only remaining water-powered mill in the state, the place shows off the ingenuity of the Oregon pioneers of 160 years ago. In a valley that looks as flat as a pool table, the builders managed to create a system of water works with enough head to drive three powerful turbines. One of them still works, and when all the moving pulleys and belts and gears fill the building with their racket, the enormous energy of water power is a wondrous thing to admire. 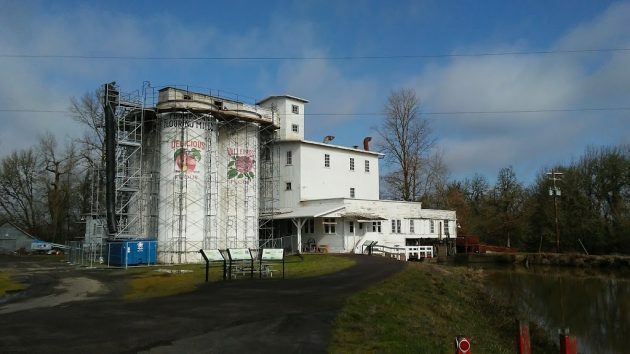 Oregon State Parks bought the mill and surrounding acreage in 2004 and opened the site to the public three years later. The mill no longer produces feed pellets and has quit generating electricity. A couple of Calapooia River dams have been demolished for the sake of migrating fish, but in 2013 the state installed an adjustable dam. Because of this, there’s enough water coming down the millrace to turn the turbine when visitors show up. Scaffolding now surrounds the 100-year-old twin silos. Park Ranger Tom Parsons explained that the concrete at the top was beginning to crumble, so repairs are being made. When that’s done, the iconic advertising murals will be refreshed as well. Elsewhere on the 90-acre mill property, the state is uprooting a plantation of trees the previous owners planted as a commercial venture in the 1980s. The trees are going to Bowers Rock State Park in Albany to help stabilize the banks in a restoration project of old side channels there. One side benefit: Visitors to Thompson’s Mills will regain the view of Marys Peak and the Coast Range, the same view the site afforded in the days of old. Park Ranger Tom Parsons shows a young tourist how to open the gate holding back water in the millrace. Tom Parsons stands by a one-man elevator that can lift him to the top of the five-story mill in seconds. No bike in the pic so you must have driven :>) Given your “seniority” I’ll grant you a bit of leisure. Those exposed gears give me concern if a “tourist” should get too playful with the equipment. Thompson’s Mills (didn’t it used to be known as Boston Mills?) is fantastic on its own, irrespective of how it stacks up against a carousel. I stop by every chance I get. And yes, land use laws (not all of which are bad) would probably prevent its construction today. Times change, sometimes for the better, sometimes not. Regarding how Oregon land use laws might apply to a current project like Thompson Mill, I don’t believe things are all that clear. In 2016, the appellate court ruled in favor of a Linn County farmer (Gilmour vs. Friends of Linn County) who wanted to construct a facility that receives trucks, processes agricultural products and ships products out. While there are certainly technical difference between a straw compressing facility and a grain mill, neither of them looks much like farming. My point is, land use laws (like all law, it seems) are still open to interpretation by the courts. Thompson’s Mills state park is truly a gem in our backyard. What an amazing place to visit and learn about Willamatte Valley history and things mechanical. A great place to take the family and have a picnic, feed the chickens and just relax. Thanks HH for reminding us of this treasure. John,…. Gilmour got that facility built over rational, reasonable arguments against it. Now daily, 80K-pound straw trucks during harvest time rumble West bound on W. Queen on City streets NOT designed for those loads. Neither was the County road the facility was built by. The rest of the year those compressed bales come back thru East bound on W. Queen in those mega size shipping containers. While I’m harping on trucks, when that Target warehouse was built wasn’t there some “agreement” between Target & City of Albany to “limit” truck traffic back-n-forth to I-5 and Hwy 34?? Those trucks continually rumble down Pacific Blvd 24/7 to this day!! Please note that I was not writing in support of the GILMOUR decision. My point is that land use law is not as simple as saying this or that could never happen under current land use law. GILMOUR illustrates that pretty well, I think. Thanks Hasso. Took my wife to the old mill yesterday. Though it was cold, docents Dan and his wife were exceptionally gracious in accommodating us. As a “techie” I was fascinated by the mechanicals and design. Definitely will be going back when warmer climes come around. Much appreciated article. Thompson’s Mills are indeed a mid-Valley treasure that we all should appreciate and support. It is unique in the state. 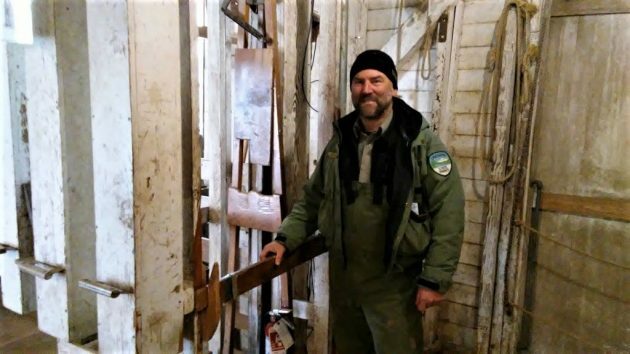 Wouldn’t it be wonderful for all if it could be made to operate as a grist mill again–as so many similarly aged mills in mid-west and east coast do? Sign me up as a volunteer! Thank you for sharing this treasure! As much as we love to tell visitors about Thompson’s Mills, our locals are sorely unaware of this treasure. Access was very limited prior to State Parks running so school children are now able to visit on field trips but there are generations of people who have lived in the area their entire life and are still not aware of the mill, much less been out to see it. Winter is a great time to go for those with allergies- it is 160 years old so dust is expected but not as prevalent with humidity.